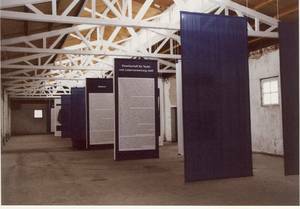 The “Forced Labour in the Women’s Concentration Camp Ravensbrück – Textile Production for the SS Economy” exhibition is in the former textile factory buildings inside the Ravensbrück Concentration Camp and depicts the prisoners’ forced labour for the SS’ own enterprise, “Society for Textile and Leather Work, Ltd” or in German “Gesellschaft für Textil- und Lederverwertung mbH “ or “Texled”. In the Texled manufacturing plants in the Ravensbrück Women’s Concentration Camp, the female prisoners had to work under inhumane conditions as well as while suffering harassment from the SS staff. They made prisoners’ clothing, Wehrmacht and SS uniforms as well as objects for personal use by the SS staff. It is made clear that the Ravensbrück Concentration Camp was also integrated into the system of National Socialist mass murder of European Jews by depicting in the exhibition the reusing of furs and valuable objects which came out of the extermination camps and were hoarded in the “captured goods barracks”. While some of the Texled factories provided the SS with significant yields, others were discontinued or reduced because the production methods were mostly based on handwork which proved to be uneconomical. The factory exhibition uses eye witness reports, photos, documents, drawings and archaeological findings to bring the visitor closer to the subject matter. It constitutes an initial building block for a future, comprehensive exhibition on forced labour in the Ravensbrück Women’s Concentration Camp. Photo: Brandenburg Memorials Foundation/Ravensbrück Archive. by Sabine Röwer, Fürstenberg.